Mandy from Amy Grigg Face Painting was kept busy during the launch of the Wests Group Macarthur Big Yellow Umbrella partnership on Thursday morning. There were a lot of children at the official launch of the Big Yellow Umbrella and Wests Group Macarthur partnership – and they were all very well behaved. So well that their impeccable behaviour was duly noted by some of the speakers, including Dr Mike Freelander, a paediatrician for 30 years before going into politics in 2016. “Working with children is the most important job of all,’’ Dr Freelander said. It was apt that the children brought themselves into the conversation via their good behaviour because after all that’s what Big Yellow Umbrella is all about. As part of the partnership, Wests Group Macarthur are donating a play group trailer and sponsoring the Play Hub initiative. 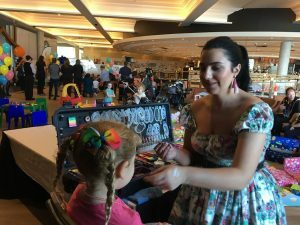 But it did help that the official launch space in the Bambu lounge area of Wests Leagues club Leumeah was made children friendly for the occasion, with face painting and lots of games to keep them occupied. But the children had another reason for being there on Thursday morning. In partnership with Big Yellow Umbrella, educators , children and staff at Camden Family Day Care performed a special “acknowledgement to country’’. Then it was back to quiet fun for the children while the adults made speeches in the background. Edward Feuerstein, the general manager of Big Yellow Umbrella, was grateful to Wests Group Macarthur for their contribution. “The support and sponsorship from Wests provides a community impact that changes lives by enabling Big Yellow Umbrella to meet the needs of local children and families in the Macarthur area,’’ Mr Feuerstein said. Wests CEO Tony Mathew said: “We are delighted to see this community partnership come to fruition. Campbelltown MP Greg Warren and Dr Freelander both praised Wests and Big Yellow Umbrella for forming a partnership that would benefit the local community.